The Poor Knights islands are remnants of an ancient volcano that eroded away long ago, leaving its hardest volcanic plug behind. In this chapter we'll study and try to understand why things are the way they are and how this influences underwater life. We'll also look at the Poor Knights' terrestrial life. geology: the ancient history left behind in rocks and features. Ice ages. biogeography: surrounding influences: temperature, currents, nutrients, edge of continental shelf, tides. 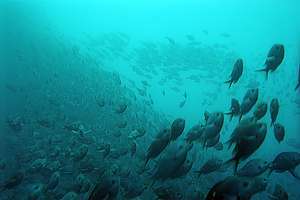 marine ecology: the underwater environment: habitat zoning, nutrient cycling by birds, the sand. terrestrial ecology: the terrestrial environment: vegetation, sea birds, land birds, lizards and insects. soils in NZ: NZ's continental drift, climate zone and how soils developed, and then were exploited and lost. oceanography: how the planet works, oceans, currents, winds, climate, waves, tides, storms and so on. degradation timeline: timeline of observed and measured degradation events in northern New Zealand. During its 60 million year long separation from the ancient super continent Gondwana, the two parts that would slide together (Rangitata continent) and join to form present-day New Zealand, have been tearing apart from the Antarctic Plate and colliding with the Pacific Plate. When tectonic plates collide, the sea plate will slide under the land plate, causing a trench while pushing the land up. This formed Great Barrier Island and the Coromandel and Kaimai Ranges. In the process, also volcanoes formed further inland. The map shows a number of ancient volcanoes that form strings, each corresponding to crust fractures of another period of geologic upheaval. The most violent volcano New Zealand has known is by far Lake Taupo (south-central outside the map). Rhyolitic volcanoes like this, contain light molten rock (SiO2) with a lot of gas (CO2), and when they explode, form clouds of ash. Later in their lives, the heavier rock emerges, with less gas, until eventually the volcano cools down with the last and heaviest rock remaining in its throat. This last plug, when cooled slowly, solidifies to a hard volcanic rock that will last the ages. It is thought that the Poor Knights too, were once (4 million years ago) a rhyolitic volcano, producing a huge ash cone around, that connected it to the mainland. Over time (a short time in fact), the ash cone was eroded away by the sea, and the hard volcanic plug remained. In the past million years, the world has experienced a series of ice ages with warm interglacials in-between. During the last ice age, which ended about 8,000 years ago, the sea stood nearly 100 metres lower than today, suggesting that the Poor Knights were again connected to the mainland. But as soon as the waters began rising, some 25,000 years ago, it became isolated again. So the flora and fauna on the Poor Knights have been living in isolation for no more than 25,000 years, which is enough to cause some diversification. The graph shows a possible history of the sea level in the past 300,000 years, revealing that also for a long period of time, the Poor Knights were entirely below sea level. The Poor Knights has many geological features such as caves, archways and undersea terraces. Knowing that sea waves can cause serious erosion, it is all too easy to assume that the sea has carved these. An underwater terrace can be explained by sea erosion (a beach) when the sea stood at that level. But the sea stood at various levels for prolonged times, and we do not observe that many terraces. Is an archway caused by sea erosion, but when? In the past 6000 years, 100,000 years ago, or a million years ago? A sea cave must surely have been caused by sea erosion, but this cannot explain Rikoriko which has a smooth ceiling from which no 'bricks' are missing. Neither can it explain Red Baron caves' vertical tunnels, and it can't explain Taravana cave at the Knights' sheltered side, at all. Obviously a volcanic plug is full of cavities where once gases were. Tunnels guided liquid lava from a spewing mouth, then emptied out while lava flowed downhill, leaving a vacated tunnel behind. Look at South Harbour for instance. See how all the archways and passages are pointing outward from an imaginary centre? This cannot be explained from sea erosion. Biogeography is the science that links life (bios) with where it lives (geography). So it provides a way of looking at the bigger picture, in particular temperature, currents and waves. 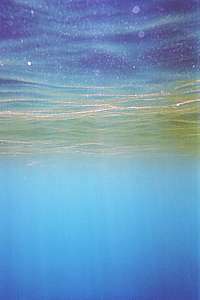 On this web site you'll find a large chapter on oceanography that paints the worldwide picture, of which this chapter is a small addition. Because the tropics are warm and the poles cold, winds flow to equalise this difference. But the rotation of Earth deflects their path, resulting in climate bands that dominate rainfall and wind. As winds blow over the sea, they get a grip on its surface and push it along. A surface current results. The places where winds blow consistently in the same direction, create permanent currents that contribute to large ocean gyres. The largest of these is the South Pacific gyre, as shown in this diagram. The currents of the gyre also transport heat from the tropics to the poles and cold from the poles to the tropics. 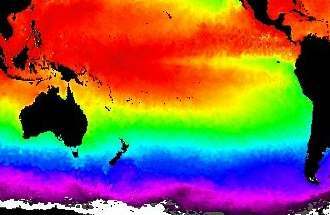 For New Zealand the warm Coral Sea current is of critical importance since it contributes at least 2ºC to temperature. From the Pacific Gyre, the temperature distribution shown here, can now be understood. The green band shows how subtropical water is pushed towards the equator, along the coast of Peru, where it bathes the Galapagos Islands' water in much the same temperature as northern New Zealand (because the sea warms up slowly). Notice that the western side of this large gyre does not show an equally pronounced red plume descending along eastern Australia's coast (because heat escapes quickly), but the green band reaches south to Tasmania. Note that these bands move up and down with the seasons, and also that the Pacific Gyre is sometimes stronger than in other years. When this happens, northern New Zealand becomes noticeably warmer, particularly its sea. If we had to give names to the arbitrary 'false colour' scheme, it would be as follows: red= warm tropical, yellow=cool-tropical, green=subtropical, cyan=temperate, blue=subantarctic (subpolar), magenta=antarctic (polar). The diagram shows how currents flow around New Zealand. Warm tropical water drifts southward along Australia's east coast in the East Australian Current (EAC) where it splits into two currents. The warm water flows eastward along the tropical front, brushes past the Poor Knights and veers off into the Pacific Ocean. A front in the sea is formed when warm water meets cold water (Tropical Front, TF). Because the warm water wants to lay on top of the cold water, the two won't mix, and a virtual wall between the two is formed, with vertical upwellings and down drafts, and horizontal eddies. It is a place of high productivity. The remaining water flows towards Tasmania where it leaves the coast, colliding with sub-antarctic cold water along the SubTropical Front (STF). The cool (purple arrows) and the cold (blue arrows) water with their associated upwellings, pass east of the South Island where it feeds the seal colonies and sea birds. The two then veer off eastward into the Pacific. Some of the cool (purple arrow) water passes along NZ's west coast, to collide with the Tropical Front, pushing around North Cape and sliding under the warmer water. This slow current passes along all the dirt of the North Island's big rivers, and all the sewage from Auckland and Hamilton, and the cows in the Waikato, that all deposit nutrients in the sea. The sea becomes overfertilised and sick, which we measured and confirmed (DDA). This sick sea curves around North Cape to plague the waters of Northland, including the Poor Knights. In years when the ocean currents flow fast (La Niña), our coasts are rinsed better than in those years when the currents stagnate (El Niño). This happens in a cycle of about 9 years, with 1983, 1992, 2001 the years of mass mortalities. See degradation timeline. Nutrients in the sea are important to sea life and the life that depends on it, like dolphins and humans. The map here was generated from satellite information measuring the chlorophyll (green plant matter) densities. It is a complicated scientific process that has a number of limitations, like not being able to distinguish between brown mud and brown plankton, and looking only at the first few metres of depth, and it being a snapshot in time. But what it shows is telling enough. Notice that the scale is logarithmic, portraying a density range of 1000x (0.01-10.0). Small colour differences thus mean large quantitative differences. The rich nutrient flow of the west coast is hidden by clearer water overlaying the dirtier coastal water. Remember that this coast has almost constant westerly winds and waves. The nutrient-rich water surfaces between North Cape and the Three Kings islands, joining the natural upwellings of the Tropical Front. It then bends around the Cape, flowing south under another blanket of warmer water, but it surfaces here and there. Notice how the nutrients stay concentrated over the continental shelf (light blue contour). Notice also how nutrient-laden water exits from the Hauraki Gulf northward and eastward, and that a clearer body of water stretches between Whangarei and Mokohinau. As you can see, the Poor Knights appear to be threatened by eutrophied waters from the west coast. Our measurements indeed support this. In due time all sea life will be affected, like fish, gannets, shags, shearwaters and dolphins. This in turn could influence the terrestrial life. The Poor Knights are located at the edge of the continental shelf, which is depicted in this diagram. 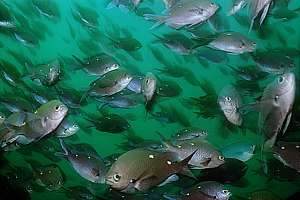 One would think that the continental shelf empties out into the open ocean, through wind-driven currents and ocean currents, but there are forces at work to keep nutrients over the productive shallows of the continental shelf. The mainland makes an enormous difference to the strength of the waves and surface currents, with the result that the sea wind has a far stronger effect than the land wind, thus mopping nutrients back onto the shelf, and also larvae back to the shore. 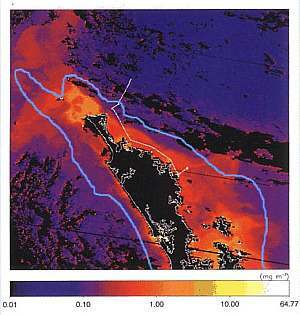 The coastal current (East Auckland Current) which runs effectively at 50-100m depth, runs further out in sea, and as it clings to the land, it rotates in such a way that deep nutrients are pushed back to the surface, and onto the shelf. Finally, eddies splitting off the coastal current, gyrate nutrients back. From this scenario one can now understand that the Poor Knights are on the one hand under the influence of a unidirectional ocean current that connects it to warmer places like Australia, Norfolk Island and Lord Howe Island. On the other hand it experiences eddies, that can at times be very strong, whipping currents where one would not expect them (like in Labrid Channel). It can now also be understood that the larvae produced by the creatures at the Poor Knights, find their way downstream and to the mainland, but there is no strong mechanism to take larvae back out to the islands. Thus recruitment is weak. 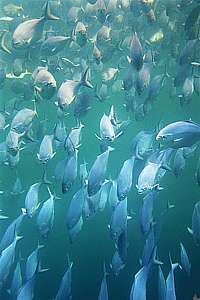 The other main factor is that the islands are located close to natural upwellings that result in high productivity and high fish densities. However, in recent times, this has been changing, and we think because polluted west coast water is now reaching the islands. In New Zealand the moon tide runs as a long wave around both the south and the north island twice each day. It is a deep and fast wave (see oceanography/tides). Where this tide wave becomes distorted, such as when entering a harbour like the Hauraki Gulf, the wave becomes distorted, resulting in tidal currents. But out in the open ocean, when folding around a remote island in a deep sea, it generates hardly any tidal currents. The Poor Knights are not exactly such a remote island, but tidal currents are not as fierce as found nearer to the coast. Even so, the moon tide causes currents that may work in unison with coastal currents and eddies, and cause unpredictable surprises. Perhaps the most important factor to consider is that the Poor Knights islands are long and narrow, orientated in a north-south direction, in parallel with the mainland, and across the direction of the main wave action (NE). This makes its easterly side decidedly exposed to wave action, but its westerly side sheltered from damaging hurricanes. It acts like a barrier island. On the east side we'll find rugged seaweeds and other rugged organisms, whereas on its west side sensitive ones. Combined, the two environments lead to a higher than normal biodiversity. In addition there are archways that can on the one hand exacerbate (make worse) wave action (Barren Arch), and on the other hand provide shelter (Middle Arch, Northern Arch, The Tunnel). This north-south orientation achieves that both sides receive an almost equal amount of sunlight, but south-facing shores receive significantly less sunlight, also because the cliffs are so high that the sun cannot peep over them (Sombre Forest, Rocklilly Bay, see further down). This diagram shows the general idea behind underwater habitat zoning in northern New Zealand, but there are differences that apply to the Poor Knights. For instance, because near the surface, all its shores drop off vertically, except in a few places. So the intertidal zone is also narrow, except on its eastern side where waves wet a wide splash zone with barnacles and encrusting seaweeds. Directly on and under low tide one finds robust stringy seaweeds or bladder wracks, of which the golden wrack (wire weed, Carpophyllum angustifolium) is the toughest. On some places of the east side, it competes with the ultra tough bullkelp (Durvillea antarctica), which underlines the connection with the west coast and the South Island where it dominates. Below the stringy seaweeds comes the barren zone, caused by storms but often occupied by sea urchins. Because the eastern shores here are so steep and exposed, urchins cannot maintain themselves there, and the barren zone is populated by turfing calcareous algae. Below the barren zone extends the stalked kelp forest (Ecklonia radiata), which eventually gives way to the deep reef of animal rock dwellers like sponges, gorgoneans and bryozoans. These two habitat zoning diagrams were measured by us in 1993, and apply only to north-facing shores. We were able to do so once we discovered that the depth of the sandy bottom is a measure of the strength of the worst waves. On left the general pattern, showing the zoning with species names, and on right a number of typical shore profiles were also included. It is important to notice that as wave exposure increases (towards the foreground), the shore becomes steeper and steeper as a reaction to minimise biotic and material losses (erosion). See our Least Loss Landscape hypothesis. Steep shores reflect the waves, such that minimal energy is absorbed. Notice also the spontaneous terracing, probably caused by plant life as plants promote terracing. For the Poor Knights the 30m terrace is indeed present on its west side. On truly remote islands like the Kermadec Islands, the influence of seabirds on the marine environment cannot be overstated. The diagram shows how it works. Birds nest in their millions on the island, and deposit half of their meal on the rocks or in their burrows. These bird droppings are extremely high in nutrients, and should they consolidate and harden, would become the most sought after guano fertiliser. However, before that happens, rains dissolve some of the nutrients and surround the islands in a slick of nutrients that almost immediately turns into phytoplankton. Hours later the zooplankton will be feasting on it, and the food chain is closed by bait fish, and sea birds. However, in the meantime the slick of productivity has spread out wide and deep, and is drifting away on ocean currents. Fortunately the birds recycle a good part back onto the land. How much is not known, but it can be observed at the Knights after a rain. 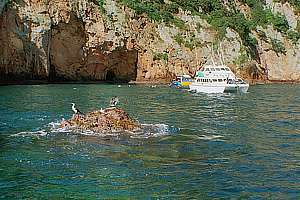 One day I happened to snorkel near Northern Arch, Catton's Cave when I noticed small streams seeping down the rock face and colouring the sea surface yellow - a kind of pee. As I continued downstream, I noticed that this pee was turning green. The gentle current was taking the slick southward, clinging to the shore, perhaps 10m wide, becoming wider and deeper. It was amazing to see how little pee could generate so much green soup. Then little dots began to appear and the little dots became shrimps. That's where it ended for me, except that I took the boat to Jan's Tunnel at the southern end of the islands. The slick had arrived here and like a continuous conveyor belt, had been going on for days, perhaps. In the tunnel the shrimps were so dense that one could hardly see. The red horse anemones (Isactinia tenebrosa) were having their day, many closed up for they were full. The shrimp were moulting, as transparent moults glared in the sunlight. 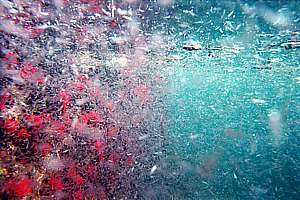 Since the plankton-feeding fish had missed this event, the shrimps were even mating and dying. At the bottom a Porae quietly mopped up the fallen shrimps as if it always did this. What an awesome experience. f012023: the thin slick of yellow pee has turned into green phytoplankton soup, while also spreading wider and deeper. f012033: little white dots became agile shrimps, feasting on the phytoplankton. f012014: in the meantime blue maomao were busy somewhere else, not aware of the coming party. f012035: at Jan's Tunnel the zooplankton had become a riot, shrimps moulting and procreating and dying too. The red blobs are horse anemones sharing in the feast. f012037: as spent shrimps sank to the bottom, a porae was waiting for them, casually slurping them from the bottom. 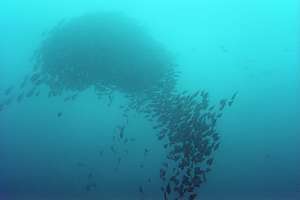 The fact that the semi-pelagic fish schools did not notice this not so unusual event, may be explained by them not being hungry or by them being unobservant, but these fish know very well what is going on in the sea. Scientists have measured that the zooplankton upstream from the Knights is very much denser than that downstream of it. So the many planktivores (plankton pickers) do a very good job of depleting this resource. For this reason, being upstream rather than downstream, gives them an important gain in competing for the stuff. So, the general idea they have is that upstream=food. The yellow pee slick described before, however, equates to downstream=food, thereby complicating the issue. 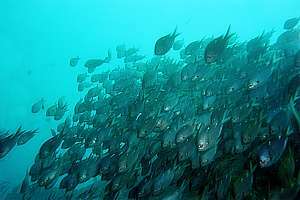 Thus the current = coastal current + tidal current, plays an important role to their daily rhythms. 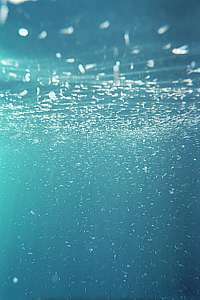 When the current stops, it is time to rest (in shelter) and to digest (in shallow warm water). Hence their many daily migrations to and from shallow caves, to and from promontories. The demoiselles also migrate to and from spawning spots, guarded by males. So they are the busiest fish of all. I spent days following the streams of migrating demoiselles to understand what they were up to, and surprise? They actually also migrate the whole length of both islands, when the current changes! It seems a waste of energy, but for them it is apparently worth it. So, each time that you see these small fish rowing busily with their breast fins, think about how effective their way of swimming really is and how busy their lives. f040617: close-up of migrating two-spot demoiselles Chromis dispilus. Green ones are females, blue ones males. These are young fish. f021125: a serious migration scene, showing thousands of demoiselles with a single purpose. f021126: demoiselles gather in tight formation to collectively ascend into the current. . f021122: while slowly degassing their float bladders, demoiselles together make the slow ascent up into the current and away from the sheltering rocks. Significant sandy areas are not likely to be found around remote pinnacles, one would think. But the reality is that the Poor Knights have a sustainable quantity of it. One would think that waves would soon wash all sand into the deep, but it is staying in some places. What's going on? The sand habitat is home to a great variety of organisms, most hidden in between the sand grains, or burrowed out of sight. 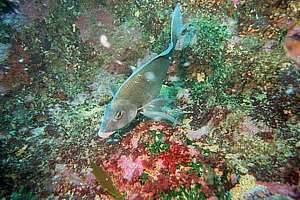 Divers will notice that the sandy areas are never devoid of fishes. On the contrary, one finds quite a lot going on. Wrasses nip and turn the sand to find morsels of food, goatfish stir the sand with their barbels, lizardfishes and scorpionfishes lay there in ambush, hat urchins crawl over it and stingrays come to rest there, and so on. The sand we know from white beaches consists almost exclusively of silica (SiO2), which is formed when rock weathers under a forest, as soil is formed (see enviro/soil). It does not result from bare rock breaking into small pieces. The silica sand may be a million years old, having been there for many ice ages and interglacial like today. When examining the sand around the Poor Knights, one will see that it is high in silica but also contains limestone remains of shelled organisms, from snails to bryozoans. These gather at the bottom of cliff faces. Sand is of course found only on flat bits of rock, and the larger these flat areas, the more significant the sandy habitat becomes. Between Serpent Rock and Rikoriko extends a slightly sloping flat area, often thought of as an ancient sunken beach, which may not be true. It could well have been a large terrace maintained by forest vegetation during the ice ages. The forest would explain the amount of silica found. The other significant sandy area is found from Ngaio Rock through Labrid Channel to South Harbour. This too is best explained as a forest terrace during ice ages. Another large terrace is found in Bartle's Bay, but its sand is stirred by large storm waves and transported through the gap between the two main islands, where it contributes to the Sand Garden. Westerly waves are just strong enough to mop sand back onto the Sand Garden, to a depth of about 30m. Any sand below this margin slips into the deep. terracing for horticulture and inhabitation. Stone walls. use of the forest timber for canoes, palisades (stockades) and cooking. All mature forest trees have been used, followed by the importation of timber from the mainland. The native totara tree was used for making canoes. pigs have been introduced and left to roam wild, with serious consequences for the native wildlife. the beautiful Poor Knight lily () with its extravagant sprays of red flowers, is abundant and occurs no where else except one, a rarity on the Hen Island of the Hen and Chicken Islands. the Poor Knight mapou and Poor Knight's houhere which differ from their mainland relatives. Other coastal natives found on the island include: kohekohe, tawapou, karaka, ngaio, taupata, karo, mahoe and karamu, all normal trees and shrubs of a mainland coastal forest. coastal astelias (a tree epiphyte, kowharawhara, Astelia banksii), rock lilies (rengarenga, Arthropodium cirratum), flax (harakeke, Phormium tenax) and toetoe (a tall coastal grass, Cortaderia splendens) cling to rocky outcrops and inland cliffs. No less than nine species of petrel (flesh-footed shearwater Puffinus carneipes, sooty shearwater P. griseus, fluttering shearwater P. gavia, fairy prion Pachyptila turtur, grey-faced petrel Pterodroma macroptera, Pycroft's petrel Pterodroma pycrofti, white faced storm petrel Pelagodroma marina, diving petrel Pelecanoides urinatrix) flock to the islands to breed between October and May. Late at night one can hear them coming home in their thousands, shouting to one another while flying fast in the dark, criss-crossing one another's paths. Then they mysteriously dive into the dark vegetation, to land precisely on the spot where their burrows are found and their chicks are waiting. 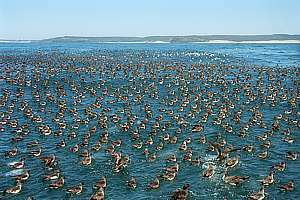 In late summer one comes across large swaths of water with young birds 'parked', awaiting for the return of their parents. And every time, these parents flawlessly home in on their chicks' cries, even in pitch darkness. About 2.5 million Buller shearwaters (rako, Puffinus bulleri) breed only on the Poor Knights, to which they return from their journeys to outlying islands, the Chatham Islands and even from as far as California! Researchers have noticed that these birds show no fear of Man, and when they accidentally land on a ship's deck, they can be handled without fear or aggression. 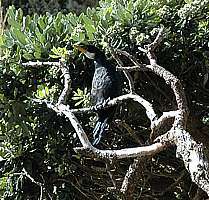 The young birds (rako) are a prized delicacy by the tribes who occupied the islands, and who cooked and rendered them in their own fat, then stored them in hollow bullkelp fronds, and left to dry. The Maori also mastered the preservative method of smoking, for which the wood of manuka and kanuka was preferred. 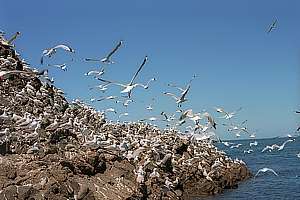 Australasian gannets (takapu, Morus serrator) nest on the Poor Squires Islands (the Sugarloaf and the Pinnacles) in their thousands. From this strategic, inaccessible fortress they swarm out in small groups over distances exceeding 200km, effortlessly going out in the morning and returning by night. Seeing streams of these large birds flying low over the water, is quite impressive. Their flight consists of a few wing flaps, followed by a glide. Gannets fish by diving from 20-40 metres height, while holding their wings streamlined alongside their bodies. As they shoot down to 3-5m depth, they steer with their wings, while using their long necks and beaks to catch their prey. It is a surprisingly efficient method, perfected by diving into their own shadow, arriving from the blinding sun. Another strategy is flying low over the water and diving at a low angle into a previously scouted patch. A gannet does not dive for a single fish, but aims for a few from the air, and once in the water, makes a fast decision. The Poor Knights also has a resident colony of pied shags (karuhiruhi, Phalacrocorax varius) that can usually be found in trees above The Gardens, or drying their feathers on a low rock. 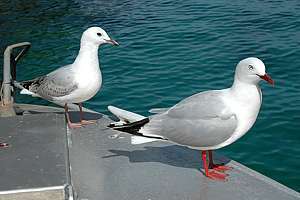 Red-billed gulls (Larus novaezealandiae, tarapunga) used to be common, gathering over surface-feeding schools of fish. Other sea birds encountered are white fronted terns (tara, Sterna striatis) and little blue penguins (korora, Eudyptula minor). f219022: Buller shearwaters (Puffinus bulleri) in their thousands waiting for the wind to pick up. These storm birds glide effortlessly on the uplift from waves, shearing the waves so close that their wings tip the water. 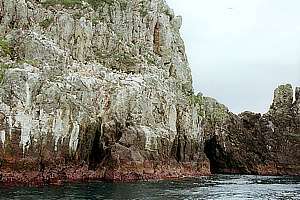 f218819: a gannet colony on Sugarloaf Island. Males arrive first at the end of July to prepare the nest site they occupied the year before. Gannets mate for life. Young birds return to the colony after two to five years to find a mate and continue the cycle. 0710157: although gannets (Morus serrator) can grow old, they live a precarious life that demands food every day. 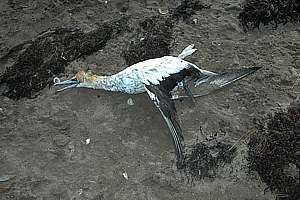 A single storm preventing them from feeding, can result in many dead or emaciated birds that wash up on a beach. f030504: pied shags drying their feathers on a pinnacle in The Gardens. Shags are such good free-divers because their feathers become wet, no longer holding trapped air. After their dives they cannot fly very well, preferring low rocks for drying up, after which they are able to fly to their higher roosts. 0612107: a young pied shag (karuhiruhi, Phalacrocorax varius) had lost its bearings and overnighted in a shed. It has just moulted but does not have adult plumage showing a white crop. Also its cheeks are still yellow. 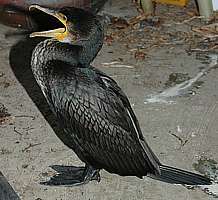 0701120: the little shag (kawaupaka, Phalacrocorax melanoleucos) is always very shy. It has a rough crest. Here it is drying its feathers in a sheltered tree above South Harbour. Notice its much smaller beak. f015332: a fledging blue penguin (Eudyptula minor) about to lose its nest down. This variety is white under its flippers. 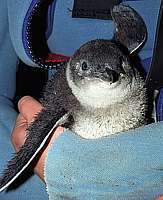 Blue penguins live a harsh life, swimming long distances each day. 0701113: red-billed gulls (Larus novaehollandiae): a mature one in the foreground and a young one behind. The young one does not have red feet and bill yet, and its plumage is speckled. f218937: red-billed gulls used to be very numerous on Serpent Rock, but their numbers have dwindled considerably. The main resident land birds on the main islands are bellbirds (korimako, Anthornis melanura) and red- crowned parakeets (karaiki, Cyanoramphus novaezelandiae). Fantails (piwakawaka, Rhipidura fuliginosa) are found in small numbers while kingfishers (kotare, Halcyon sancta), pipits (pihoihoi, Anthus novaeseelandiae) and harriers (kahu, Circus approximans) are often seen. The elegant, dark-slated spotless crake (putoto, Porzana tabuensis) and banded rail (mohopereru, Rallus philippensis), both swamp birds, forage on the forest floor. Summer visitors are the long-tailed cuckoo (koekoea, Eudynamys taitensis) and shining cuckoo (pipiwharauroa, Chrysococcyx lucidus). The islands have a wide variety of insect and reptile life. 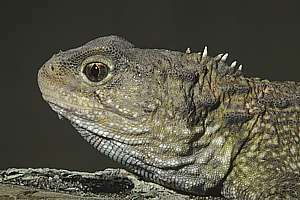 Tuatara (Sphenodon punctatus) are found on the larger islands, along with two species of gecko and five species of skink. Duvaucel's gecko (Hoplodactylus duvauceli), New Zealand's largest gecko is well established and can reach 30 cm in length. During the day it hides in the caves and crevices or under bark and stones, venturing forth at night time in search of berries, nectar and insects. A giant centipede is found on Aorangi Island, as well as the flax snail with a long spiral shell, and several species of weevil. 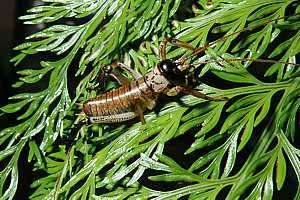 Probably the most frightening of the inhabitants of the islands are the giant tree weta, growing up to 8cm and the giant cave weta. This latter insect has a body about 6cm long but measures 30 cm from the top of its antennae to the claws on its hind legs and can weigh about 40gm. 05061131: close-up of tuatara (Sphenodon punctatus). 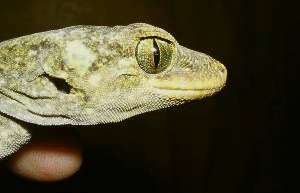 Duvaucel's Gecko (Hoplodactylus duvauceli). 0704277: a young tree weta (putangatanga, Hemideina thoracica) has formidable jaws. Visit www.reptilepark.co.nz for more information about New Zealand reptiles.